Did you know the more personal lines of coverage a client insures with you the longer they will stay with you? The concept of "account rounding" is nothing new, but the rewards for employing the tactic are many! By selling the personal automobile either with the homeowners, condominium-owners or renters policy increases the agency's sales, retention and commissions. It creates policyholder loyalty which helps brand the agency in the community. Eagle Express partnered with MetLife Auto & Home and Travelers to offer an agent the ability to package together personal auto and home coverages for their clients. By combining the client's auto and home policies with the same carrier each policy receives the benefit of account rounded discounts. This allows Eagle Express' partners premiums to compete with some of the more popular direct writers. Underwriting guidelines, coastal and geographic restrictions apply to all new business requests. There is no auto and home package availability in Alaska, Florida. Hawaii, Louisiana, Michigan, Oklahoma, or North Dakota, . Eagle Express has no auto and home package in downstate New York, which includes New York City, the surrounding boroughs and Long Island. Both Eagle Express carriers, MetLife Auto & Home and Travelers are considered industry leaders. 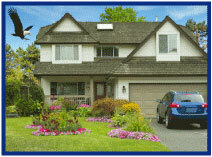 They offer comprehensive coverage options, exceptional services and peace of mind for the agent and the policyholder. Why not increase your agency's sales potential by giving Eagle Express a try on your next auto and home quote request? Just log into Big "I" Markets, and choose Eagle Express: Auto & Home New Business to request a quote. Please note that a Marshal Swift and Boeckh Replacement Cost Worksheet is required on all Homeowners 3 and Homeowners 5 quotes request. Compared to newer cars, far fewer antique and classic cars are stolen, but some thieves actually specialize in them. For a car thief, time is valuable, as the chance of getting caught increases the longer it takes to get a car moving. Collector cars were designed with few if any anti-theft devices, especially the older they get. Ironically the process needed to start some of the really old cars can act as a deterrent, but a true professional thief might bring a trailer. Once stolen, a classic car may have the VIN switched and be sold to an unsuspecting buyer. No one is immune, even famous people such as Dr. Phil, and John Schnatter, the founder of Papa John's pizza. Their cars were recovered but most are not as was the case of famous car enthusiast Steven Juliano's distinctive '70 Plymouth Barracuda. If not resold in the U.S. the cars are either chopped up for parts or shipped overseas. A handful of cars are recovered years or decades later and may have a complicated chain of ownership. A few owners have tracked down the cars on their own. Sadly, when recovered the cars are rarely in the same condition resulting in a bittersweet reunion, although there are cases where it's even better. Of course preventing theft is best and for classic cars that means layering the protection. The more layers between your client's car and a thief the better. Don't let your clients rely on thinking their classic car isn't worth enough to be a target. In fact, believing that you need to protect your classic car is usually the best first layer. Proper insurance is essential as a standard auto policy doesn't address the needs of replacing or restoring a classic car and your client will want to know why their beloved car wasn't properly covered. The experts at Chubb Collector Car program understand the emotional attachment the owners of these cars have and the pain they experience when they are stolen or damaged. Chubb offers "Agreed Value" coverage that can increase with the value of the vehicle as well as a choice of body shop and no deductible on collector vehicles. Chubb loves these vehicles so much that they sponsor car shows such as the upcoming Pebble Beach Auctions on August 18th and 19th. See the Chubb Facebook page for additional information. The minimum vehicle age for eligibility is 30 years old; Chubb will consider these vehicles on a monoline basis. If pursuing a monoline policy, though, Chubb generally does not accept newer special interest cars, i.e. 2007 and later Shelby GT500 (top of the line Mustang), Corvettes, etc. While these newer special interest vehicles can certainly be considered part of a larger account situation, provided the usage and security are acceptable AND Chubb also writes the regular use vehicles. Some examples of cars not quite 30 years old that have qualified in the past: early '90s Mercedes SL's, Porsche's (911, 928), and Land Rover Defender 90's and 110's. Chubb's Collector Car program is available to members in all states except MA and SC. Learn more by stealing away to Big "I" Markets. Don't miss Jacquelyn Connelly's three-part series on covering collector cars in IA. Read the first and second articles and watch for the third next Monday, August 14th. RLI Explains: What is a Personal Umbrella Policy? Congratulations to our agent in Virginia on a Non-standard Homeowners or Rental Dwelling sale of $5,301 in premium!